The adventures of a London Mummy. Living with L and growing Peach. I had broken up for Easter feeling full of beans. I knew that come the next holiday I would be going on maternity leave. 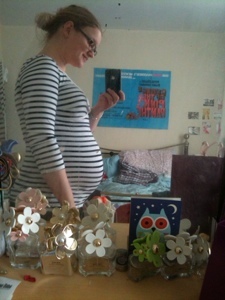 I was at a great bump size which was comfortable to sleep with, I was feeling regular kicks and rolls from baby and staring to really notice which bits were poking out. What happened in the next was the scariest point of my pregnancy. I woke in the night, the early hours of Good Friday, feeling not right, almost like morning sickness again. Queasy. I spent a lot of the night going back and forwards to the loo. Come morning when J woke up I told him how I felt and that I didn't think we could make it on our planned visit to friends for birthdays and a long weekend away. I thought we might need to follow up the next day rather than go today. I told my friend. I couldn't really stomach much that day but tired to keep fluids up. Pip was moving around still and I felt ok about treatment and feeling better in the morning. Come Saturday however I felt no better, I started the day able to keep my breakfast down but was exhausted from not being able to eat properly. We cancelled our trip away. By the evening I was worse still and even water was turning my stomach and nothing was staying in very long. I called the labour ward to talk to a midwife and get some reassurance. I wad told categorically not to come in. I obviously had novo virus or something similar and the hospital was closed to visitors because of current outbreaks. I was reassured that as long as baby was moving and I could drink small amounts of water and rehydrate I would be fine in a few days time. I went to bed feeling rubbish but trying to stay positive reassured my Pips regular movements. The next day, Easter Sunday I woke feeling worse still. No proper food for two days was really taking it's tole. I was sleepy and lethargic. I called the out of hours doctors this time. They said to monitor wee and movements of Pip and if concerned to go straight to A&E. Dehydration can cause pre term labour and this needed to be avoided. I got in a bath and tried to both drink and get Pip moving. My usual rough pokes and gentler strokes got no response, nothing. I hadn't weed all morning. I couldn't keep water in. I felt something was desperately wrong and with an instinct I had never felt before I knew I needed to be in a hospital. Dressed, bags packed (including labour bag) and J fed we left for the local hospital. I saw triaged and was taken through to the ward to be further tested. The smallest darkest trickle of wee and bloods got a big, immediate response. I was incredibly dehydrated. They said I had been right to come in. I was very ill.
At this point I also started to feel some tightening's. Irregular and not strong. But there. I was hooked up to a drip and left to rehydrate while we waited for a Gyni Dr to come and examine me and Pip. Unfortunately the first drip was inserted incorrectly and it proceeded to "tissue" into my arm, this is a painful and tingly sensation. This was taken out and reinserted in the other arm. We watched as my body greedily soaked up the liquid. The Dr came and felt Pip and tried to reassure us that Pip was probably just tired and lethargic, like I was, from lack of food. A scan showed us our baby. Heart happily beating away but Pip wasn't moving even when prodded. She said after the fluid Pip would probably start moving again and that I would be monitored again after the drip had finished. I then casually mentioned the tightening's. Concern crossed the young Drs face. No I hadn't had a show, I hadn't weed in a day and no other leaking. They were irregular and across the top of my bump. She felt one. Then quickly left the room. She came back and said I was to be admitted to the labour ward. The Sister in charge wasn't happy with the symptoms and they wanted to monitor Pip and the tightening's, scarily called contractions, to see if they were getting stronger. Dr ordered another bigger bag of fluid to follow the one I was nearly finished with. I hadn't really panicked before this point, I was calm with a sense of purpose and a plan to follow. Now I was really scared. They thought I might be in labour, they thought my baby might be on its way 10 weeks early. Being wheeled up on my bed to the labour ward is a journey I will never forget. This was not how I thought I would be arriving on the labour ward, we hadn't even been for a tour yet, it was all too soon. Luckily the ward was empty bar one lady who was about to be rushed to theatre. I was hooked up to the monitors and now Pip decided that they were going to get a wiggle on. I was so happy, even if it meant Pip was moving away from all the monitors trying to monitor their heart beat and my tightening's. We were on the labour ward for three hours in the end while they struggled to get a long enough trace. I was examined and they thought my cervix was good and high still, they didn't think the contractions would lead to a labour they couldn't stop if needs be. There was also no sign of infection which was all really positive. I was also able to eat a small bit of a hospital sandwich. We were discharged at midnight, near enough, with reassurance that if I got worse again or we were worried about Pip or I had more tightening's to come back in. I was still dehydrated after the two bags of fluid but regular wees were reassurance enough to the Drs that we could manage this at home and that I was on the mend. Being admitted into hospital was not how I'd planned to spend Easter in 2013 but I learnt a valuable lesson. This would all come in handy again when two weeks later a van drove into the back of our car leaving us all shaken but Pip happily impervious and merrily kicking and rolling away. It was also handy when the call came that a caesarean might be the best way to get Pip out. I calmly made the massive decision to go down that route knowing in my gut that this was the right thing for us. Mothers instinct should never be ignored. Should never be brushed aside. It can be a saving grace, even life saving. Open to baby, child, parent, beauty products and companies for PR opportunities and sharing.